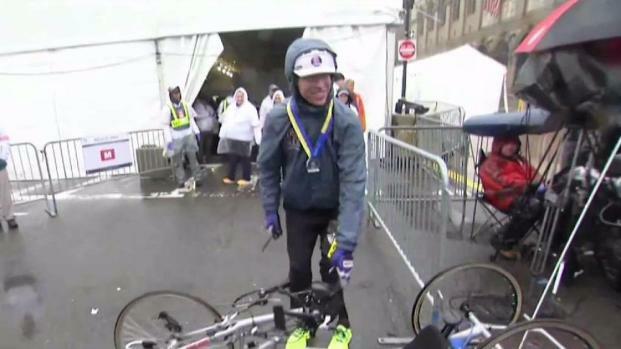 Stuart Kolb's 100th marathon was cold, wet and raw, but he was proud to finish. 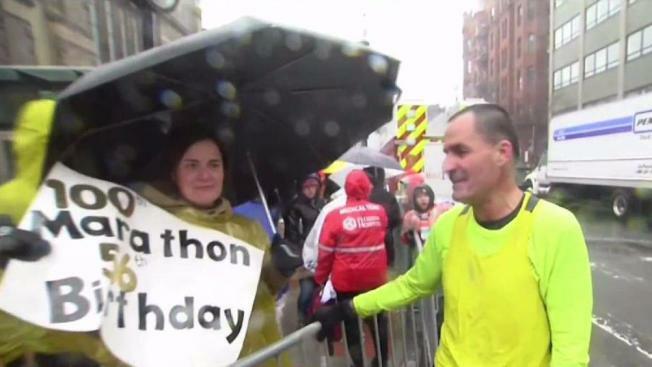 Whether it's your first marathon or your 100th, like Stuart Kolb of Green Bay, Wisconsin, the joy of finishing the Boston Marathon, especially in these brutal conditions, is indescribable elation. "It was probably a personal worst time and personal worst weather, but it was fun," Kolb said. "How can I beat it? I've got my family here and my hundredth marathon, and they've been through all of them — woo!" The dedication of not only these runners, but the fans cheering them on, braving the driving rain and wind, is unbelievable. "I don't think there's any other race in the world where the weather would be like this and there would be people everywhere, just cheering for you," said Jack Anderson, who flew in from Philadelphia. The Boston Marathon bombings were on the minds of many this year, especially for those directly impacted by the terror attack. "It's just so amazing," one finisher said through tears. "What a place — the emotion, the history." "Can't believe I finished it, and glad it's over," said U.S. Army Captain Steve Marthy. Some people got creative to try to stay dry and warm. "I didn't think it would make it all 26 miles," Catherine Kruppa of Houston said of the shower cap she wore. "Nor did I think I would." Others already had their outfits picked out and just decided to stick with it. George Totonchy of Portland, Oregon, wore tiny patriotic shorts and bow tie. But for handcyclist Patrick Downes, this is more than just a race. He and his wife, Jessica Kensky, each lost legs in the marathon bombings five years ago. Conquering this marathon and reaching the finish line holds special meaning. "So proud of us for moving on, despite a really hard five years," he said. "But we did it as a team, as a community, and that's the only way to do it." Kensky was considering handcycling with Patrick Monday, as they've done in the past, but with the weather the way it is, she decided to watch from home with her service dog, Rescue.